Just like the Apostle Bartholomew/Nathanael we studied last week, this week’s apostle was also called by two names. 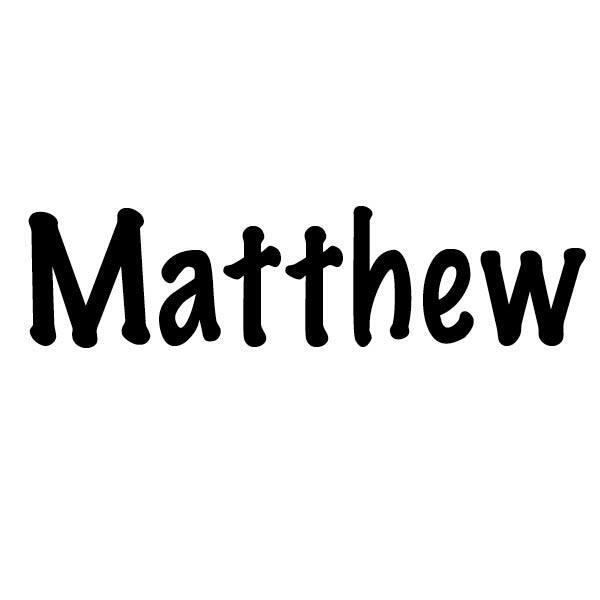 Matthew, whose name means “gift of Jehovah,” is also referred to as Levi which means “joined”. I will use the most commonly used name, Matthew, throughout this post. In the ancient world, a man often had two names. Matthew is identified by the name “Matthew” in all of the listings of the twelve apostles (Matthew 10:3; Mark 3:18, Luke 6:15; Acts 1:13). But in the passages concerning Jesus’ calling, his name varies among the gospels between Matthew or Levi. No reference singles Matthew out in the gospel of John. Matthew was the son of Alphaeus (Mark 2:14) and a tax collector for the Roman government. Tax collection, as a form of employment, was used as early as 212 B.C.. These men collected legitimate taxes for the government but they also collected extra fees and pocketed a percentage for themselves.They had a bad reputation of being despicable and resorting to any means necessary to achieve the money whether by malpractice, extortion, or abuse. By virtue of his employment, Matthew was grouped with the lowest levels of society. Jesus spoke to the receptiveness of faith by this level of society when he responded to the chief priests and elders that questioned him about his authority to do the things he was doing. Tax collectors fell into two different categories. The gabbai were general tax collectors who collected property, income and poll taxes. These fees were set so the ability to make extra money was low. The mokhes, on the other hand, collected specific taxes like the duty on goods transported, tolls for roads and bridges, and tariffs. They were able to collect and pocket extra money easily making their jobs more lucrative. The mokhes were divided into two different groups: the great mokhes and the little mokhes. The great mokhes hired others to work for them and the little mokhes were the ones employed to collect the taxes and run the tax booth. Scholars think Matthew was a little mokhes since he was found by Jesus in a tax booth. In his life, Matthew would have found a place to belong difficult. He was a traitor to his own people, the Jews, because he worked for the Romans. He was also a religious outcast because of his continual dealings with Gentiles. Interaction with them made him continuously ceremonially unclean and unfit for worship. Matthew would have also been a social outcast shunned by all of society for being a tax collector with the exception of those among the lowest rungs of society. With Jesus, Matthew found a place of belonging, a purpose, and an entirely different life from any he could have imagined. He left his old life and all it offered behind when he made the decision to follow Jesus. Matthew had a new life found in the life of his Lord. Tradition holds that the apostle Matthew wrote the gospel that bears his name sometime between 60-90 A.D.. Newer scholarship, however, points to another possibility over which New Testament scholars debate. What can I learn from the life of Matthew about faith? Has my life changed since I became a follower of Jesus Christ? Do I view others who are different from me with acceptance or scorn? How can I share the message of Jesus with those I consider to be the undesirables of society?